Beyond Collective is a diverse group of companies dedicated to equipping, educating, and collaborating with professional creatives. We dedicate our resources towards establishing top-tier creative environments for world-class talent and use those collaborative spaces to connect process & execution through multiple media outlets and platforms. Throughout the process we maintain focus on executing work that isn’t bound by the expectations of temporary cultural phenomenons. Our approach is always holistic and comprehensive. We welcome the clients we work with into our creative studios, introducing them to the artists we collaborate with on a consistent basis. In addition to working with established professionals, we spend time developing local outreach programs to provide first-hand experiences for independent creatives and students of the arts. All of Beyond’s studios cater primarily to professionals; both at a national level and locally. This includes international brands and world-class recording artists. We heavily recognize the importance of our supporting communities which has allowed us to develop firm roots through multiple, continuously evolving outreach programs. Our studio model is centered on creating the highest quality facilities for world-class talent by maintaining a unique and comfortable environment. In addition to hosting outside talent, our studios are maintained as headquarters for our production house as well as work done for our collaborative online platform. Our studios act as the foundation upon which we will continue to scale the reach & capability of our creative resources — both nationally and abroad. 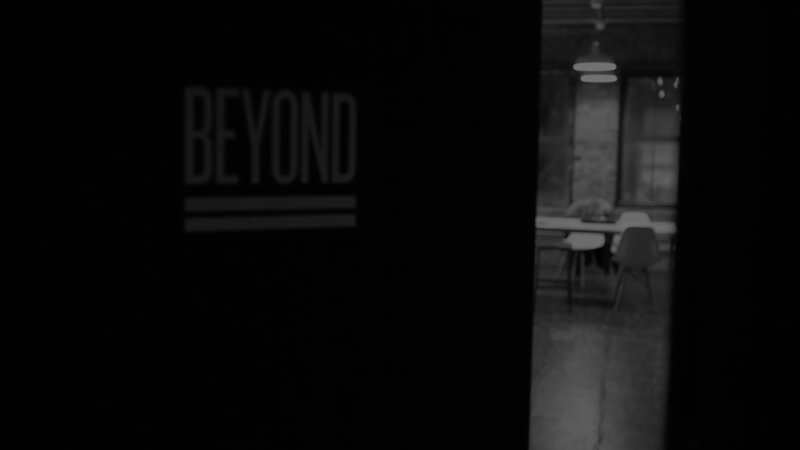 Beyond currently maintains studios in both NYC & DC. The Beyond Production House is an agile team of designers, filmmakers, photographers, and audio engineers. We build brands, develop digital marketing strategies, film commercials, and produce commercial grade audio recordings for a diverse range of clients including established artists, large agencies, and non-profit organizations. We believe in taking risks, experimenting, failing, adapting, and learning on a daily basis. Through our collective experiences with boutique clients and internationally recognized brands we’ve encountered a good deal of challenges — ranging from heavy involvement in national ad campaigns to the process of writing, directing & producing feature length films. Knowing full well that every new project will bring new challenges, we whole-heartedly look forward to tackling them all. In order to deliver technically sound and beautifully effective work we consistently invest in the highest quality production gear available. With our headquarters in Brooklyn, New York, offices in Washington, D.C., and a network of affiliates in Los Angeles, we are able to be where our clients need us, when they need us. At the end of the day, we’re ready to pack up our bags and travel anywhere in the world that we have the chance to make something great.